* Share price as of close on January 14, 2016. * Estimates are those of the Company. Effective from fiscal year May 2016, the definition for net income has been changed to net income attributable to parent company shareholders (This change of definition on net income applies to the rest of the report). * A 100 for 1 stock split was conducted on December 1, 2013. This Bridge Report provides details of Nihon Enterprise Co., Ltd. and information pertaining to earnings results for the first half of fiscal year May 2016. Nihon Enterprise aims to be a "mobile solutions company" with two pillars of business: 1) The contents services business, where various contents including traffic information, entertainment and lifestyle services are created and distributed to smartphones and other mobile devices, and 2) The solutions business, where contents creation and operations, system integration, advertising (in-store affiliate), reverse auctions, IP phones and other business support solutions (Cost reduction) are provided. Furthermore, Nihon Enterprise is also promoting efforts to expand its business into overseas markets and has established a business platform for the provision of Japanese contents in China and India. Nihon Enterprise listed its shares on the NASDAQ Japan Market (Currently called the JASDAQ Market) of the Osaka Securities Exchange on February 16, 2001. On July 10, 2007, it moved its listing to the Second Section Market of the Tokyo Stock Exchange, and then to the First Section Market on February 28, 2014. Nihon Enterprise's employees are committed to maintaining the basic corporate philosophy for eternity by repeatedly learning from the philosophy reflected in its "Mission Statement, Doctrine, and Five Spirits" and "Nihon Enterprise Management Principles." President Katsunori Ueda believes that it is Nihon Enterprise's obligation to maximize "shareholder value" and "make effective use of capital by not wasting a single yen". From the start, President Ueda founded Nihon Enterprise with the strong motivation of "contributing to society through its businesses" and the Company pursues the achievement of this goal. Consequently, the Company seeks to contribute to society by increasing the satisfaction of its users through the provision of convenient information technology equipment and interesting and diverse contents and services. Based upon the management philosophy of President Ueda, the bulk of the ordinary income earned in the founding year of the Company was donated to the Japan Red Cross Society, the Japan National Council of Social Welfare and various children's institutions. Also, donations were made to the Japan Red Cross Society at the time of the Great East Japan Earthquake to support the victims and the reconstruction efforts in the Tohoku region. Nihon Enterprise seeks to contribute to society and to promote culture through its activities conducted as a commercial entity. Nihon Enterprise vows to achieve the five commitments listed below and to devote itself unitedly to its operations. The Nihon Enterprise Group is comprised of a total of nine consolidated subsidiaries with seven within Japan including the company Dive Co., Ltd., which provides advertising services; At The LOUNGE Co., Ltd. which provides music related services; Advanced Traffic Information Services, Corporation (ATIS Corp.), which provides traffic and other information services; 4QUALIA Co., Ltd., which provides web and mobile site development and maintenance services and contents development; HighLab Co., Ltd., which conducts native application development as part of the mobile contents business; and One Inc., which provides voice communications related solutions; and Aizu Laboratory, Inc., which conducts smartphone application planning and development. The two overseas subsidiaries include Enterprise (Beijing) Information Technology Co., Ltd., which oversees the operations in China and operates cellular telephone retail shops; and Rice CZ (Beijing) New media technology Co., Ltd., which provides IT related educational services. The Group also maintains five non-consolidated subsidiaries with three within Japan including Yamaguchi Regenerative Energy Factory Co., Ltd., which was established in June 2015 to conduct smart community business; Promote, Inc., which conducted a third party placement funding in July 2015 and provides development of automated application kitting tools for smartphones; and NE Yin Run Co., Ltd., which was established in October 2015 to provide wholesale services in China. In addition, two non-consolidated subsidiaries are operated in overseas markets including Rise MC (Beijing) Digital Information Technology Co., Ltd., which provides mobile contents distribution and character licensing services in China; and NE Mobile Services (India) Private Limited, which is a company operating in India. A feature and strength of Nihon Enterprise is its "devotion to in-house development". The Company maintains a unique strategy focused upon the development and ownership of its own contents created in-house (Intellectual properties) as part of its unique business model. This strategy has also enabled the Company to expand sales of its performance-based compensation (Success fees) contents through cooperation with cellular telephone sales companies to conduct affiliate program contents sales (Independently developed in-store affiliates). In addition, these experiences are leveraged in its mobile communications solutions for corporations. In addition to providing the function to record and manage physiological cycles, various advice about pregnancy, ovulation and other health related matters are provided. Access to real time road traffic, live video of congestion, parking lot and other information are provided with the goal of "Making it More Fun and Convenient to Go Out!". The subsidiary Advanced Traffic Information Services, Corporation provides "traffic information" and other contents to smartphone users, in addition to information provision to large shopping malls and TBS TV's "next generation smart television". Sales rose by 1.3% year-on-year to ¥2.547 billion during the first half of the current term. Strong demand for consigned development and debugging services allowed sales of the solutions business to rise by 14.3% year-on-year to ¥1.399 billion. However, monthly subscription fee based services for feature phones trended weakly and caused sales of the contents services business to decline by 11.0% year-on-year to ¥1.148 billion. With regards to profits, a rise in the share of sales of the solutions business from 48.7% to 54.9% and a rise in the cost of sales margin from 51.8% to 54.4% caused gross income to decline. Overall sales, general and administrative expenses was declined due to restraint in advertising expense. (Labor expenses still increased due to an expansion of business), but operating income declined by 29.8% year-on-year to ¥43 million. And while the margin of decline in ordinary income was limited to lesser 24.9% year-on-year, declines in profits on the sale of investment securities from ¥331 to ¥17 million contributed to a larger margin of decline in parent net income of 56.3% year-on-year to ¥69 million. This excess of quarterly net income attributable to the parent over ordinary income was caused by booking of declines in extraordinary income derived from sale of investments securities and the subsequent decline in net income before tax and other adjustments. Moreover, advertising expenses declined from ¥428 million in the previous first half to ¥342 million in the current first half. This decline is attributed to aggressive advertising conducted in the previous first half to acquireusers for native applications, and the switch to "word of mouth" advertising given the considerable success in the advertising efforts conducted in the previous first half. Sales of the traffic information, entertainment, and lifestyle divisions of the contents service business all declined. Sales of this segment can be divided between the monthly subscription and carrier fixed rate fee service categories. While sales of the carrier fixed rate fee services grew on strong demand for games and sports (Women's soccer event) related contents. sales of monthly subscription fee based services declined along with decrease in future phone users. Carrier fixed rate services with sales increase was due to smartphone usage as matter of course. This decline is attributed to the inability of smartphone usage of monthly subscription fee based services to offset the decline in usage by feature phone users. Meanwhile, sales of solutions within Japan grew on the back of strong demand for debugging services of 4QUALIA Co., Ltd. and consigned development services of Nihon Enterprise, the effect of consolidation of and One Inc. and Aizu Laboratory, Inc. (¥90 million). This rise comes despite a decline in advertising sales in the wake of the extraordinary demand recorded during the previous first half (Special sales promotion contributed to large increase in sales of NTT Docomo terminal handsets). Furthermore, increases in sales of cellular handsets to both individuals and corporate clients in China allowed overseas sales to rise. Sales of both the contents services and solutions businesses fell compared to the first quarter. However, the decline in the contents service business is attributed to ad hoc factors including the disappearance of extraordinary demand created by women's soccer events and the decline in entertainment sales due to the sale of Beijing YZH Wireless Net Technology Co., Ltd. Furthermore, the decline in sales of solutions business occurred due to a decrease in solutions by seasonal factors. Within solutions, work in process (corresponding to order backlog) is increasing steadily, which is reflected in the quarterly consolidated balance sheets (to be described later). While cost of sales margin declined due to the sale of Beijing YZH Wireless Net Technology Co., Ltd., tie ups with cellular telephone sales companies to acquire users of traffic information contributed to an increase in advertising expenses (From the third quarter onwards, advertising expense is expected to decline). Sales of traffic information were steadily booked. In the lifestyle genrea, which had declined in comparison with the first quarter, daily active users (DAU) trended favorably on the back of improvements in usability and quality. In the entertainment genrea, on the other hand, a rebound from the extraordinary demand created by the women's soccer events and the sale of Beijing YZH Wireless Net Technology Co., Ltd. contributed to the decline in sales. With regards to traffic information, the tie up with cellular telephone sales companies implemented during the second quarter has been successful and contributed to a rise in the number of paying members to over 200,000 for the first time (compared with approximately 170,000 at the end of first quarter). The newly acquired members are expected to contribute to an increase in profit from the third quarter onwards. Compared with the first quarter, sales of advertising (Advertising agency service) rose on the back of increases in the number of major collaborating cellular telephone sales companies (From 3 companies at end November 2015 to 6 companies at end November 2015) as a result of sales promotion. At the same time, sales of cellular telephones in China grew on the back of strong demand from individuals, followed by demand from corporate clients turning to increase. Furthermore, while sales of the highly seasonal solutions business declined during the first half, record high sales were booked during the second quarter. At the end of the first half, total consolidated assets declined by ¥358 million from the end of the previous fiscal year to ¥5.929 billion. A deterioration in operating cash flow arising from anticipatory investments and shift from time deposits to long term deposits (¥200 million) contributed to a decline in cash and equivalents. At the same time, an increase work in progress grew due to increases in consigned development in the solutions business and in software (Intangible assets) for content and system development with an eye for future service expansion was recorded. A decline in investment securities arising from their sale (From ¥705 to ¥510 million) and a shift resulting in an increase in long term deposits (From ¥122 to ¥325 million) were recorded in investments and others. Declines in accounts payables and unpaid corporate taxes led to a decline in liabilities. At the same time, net assets declined due to payment of dividends. As a result of these changes, current, noncurrent and capital adequacy ratios increased from 621.3%, 25.5% and 81.6% to 705.1%, 27.9% and 83.6% respectively. A decline in net income before taxes and adjustments and an increase in solutions work in progress caused the net outflow of operating cash flow to expand. An increase in intangible assets and decline in profits on sales of investment securities caused investing cash flow to turn to a net outflow. A net outflow in financing cash flow was recorded due in large part to dividend payment. A new business structure with operational headquarters established for each business segment was started in December 2015. Traditionally, a single headquarter function was responsible for overseeing both the contents services and solutions businesses. However, Nihon Enterprise has taken the decision to form headquarter functions separately for the contents services and solutions businesses to be able to execute tasks and promote business activities flexibly in line with the characteristics of each respective business realm. The Contents Business Division is comprised of three Departments: 1) The Alliance Business Department, which accelerates the "life support platform" strategy by fortifying alliances, while making efforts to expand the business realm, 2) The Contents Business Department, which provides contents to carrier platforms on a sustained basis to support earnings for the time being, and 3) The Global Marketing Department, which leverages cross cutting alliances business in and outside Japan. The Solutions Business Division, on the other hand, is comprised of three Departments: 1) The Media Solution Department, which promotes flexible marketing activities based upon the strong alliances with cellular telephone sales companies, 2) The Business Solutions Department, which oversees project acquisition capability in the booming solution market, and 3) The Tokai Solutions Department, which focuses upon clients and projects in the Tokai and Kansai regions of Japan. In addition, the Technology Department will support the above two Divisions by developing and operating systems, providing managerial assistance, improving quality of in-house packaged products, and promoting joint research and development of new technologies. For traffic information, collaboration with cellular telephone sales companies has been implemented. For entertainment services, aiming at strengthening monthly subscription fee services, e-book called "BOOKSMART" have been started for personal computer users (thus far provided to smartphone and tablet users only) and new contents have been introduced to "App Store". Furthermore, within the lifestyle genrea, the "Woman's Diary" service has been strengthened, new services leveraging the messenger application "Fivetalk" have been launched, and new contents have been introduced. Collaboration with cellular telephone sales companies has been successful during the second quarter (September to November), as reflected by the expansion in the number of paying members from 170,000 at the end of August (1Q-FY5/16 end) to over 200,000 at the end of November (2Q-FY5/16 end). In the future, "Traffic Information Mail" and "Everyone's Traffic Report" SNS services will be leveraged to raise customer engagement and to gain long term sustained usage of member services. Furthermore, the two applications of "ATIS Traffic Information" and "Leisure and Parking Information" began being distributed across the "App Pass" service from October 8, 2015. And while expenses arising from aggressive advertising promoted along with the implementation of the above mentioned collaboration became a heavy burden, the new members acquired are expected to begin contributing to earnings from the third quarter onwards. Normally, new members were charged one month worth of fees even if they cancelled their membership within one month. However, a switch to a system where no fees are charged even should the member cancel their membership within the first 30 days. And while monthly membership fees declined despite the aggressive advertising expenses during the second quarter due to this change, the number of paying members who are expected to become long-term users of this service is expected to have risen by about 30,000. Within carrier fixed rate fee services, "Chokotto Game", which targets light users and trended favorably, was ranked amongst the top games of NTT Docomo's fixed rate fee service "Sugo Toku Contents". Within the monthly subscription fee service, the digital publication "BOOKSMART" service, which had been limited to smartphones and tablets, began being distributed to personal computer users from September 8, 2015. In addition, distribution of "Kokoro to Karada Music" music service and "Soukai Mahjong! E-Shanti" game service across the "App Store" began on November 4 and November 11, 2015 respectively. At the same time, Beijing YZH Wireless Net Technology Co., Ltd. was sold in light of the declining value of holding an Internet content provider (ICP) license. ICP license is required by the Chinese Government for any mobile contents providing business to distribute contents. The value of the license has diminished because it has now become possible to provide contents from servers in Japan to users in China. Efforts to improve the usability and quality of "Woman's Diary" have been successful as reflected by the strong trend in daily active users, and measures will be implemented to leverage alliances to create usages in collaboration with body composition meter and body fat meter as a cornerstone of the lifestyle genrea. At the same time, the messenger application "Fivetalk" by Toyota Motor for inclusion in its next generation telematics service "T-Connect" (June 25, 2015) is another significant development of the lifestyle genrea. In addition, joint development of artificial intelligence related projects including conversation related products and Internet of Things (IoT) related interfaces have been started. With regards to new contents, "Love Memo" began being distributed across "App Store" and "Google Play" on October 2, 2015, and "Everyday Dog and Cat Diary" across NTT Docomo, au and Softbank platforms from October 2015 onwards. Two educational applications of the "Exciting Kids" service were also launched in December 2015. In addition, a flea market application "Dealing" was acquired from Crooz, Inc. on December 1, 2015. Along with the diffusion of smartphones, smartphone e-commerce market in Japan has been expanding, and demand for flea market and Internet auction related services from individuals has also been growing. The acquisition of "Dealing" will allow Nihon Enterprise to hold down initial investments and reduce the startup time for entry to the flea market. The Company will be able to provide various types of support for women users of any stage of life through the creation of a "life support platform" by coordinating functions between the "Woman's Diary", which has recorded over 3.00 million downloads, and "Dealing". Also, various new services that leverage the escrow functions of "Dealing" will be introduced. Efforts focused upon acquiring consigned development projects from both corporations and regional government bodies (Regional economy revitalization) are being conducted as part of the solutions division. Furthermore, efforts to fortify alliances with cellular telephone sales companies are also being conducted within the advertising (Advertising agent service). In addition, demand for replacement sales of cellular handsets of wealthy Chinese is contributing to growth in cellular telephone sales. In the solutions division, expansion of corporate investments on information systems and regional economy revitalization efforts by regional government bodies contributed to growth in both orders and sales. During the first half, distributed processing server systems developmentand debugging services for major game companies, and web services use server design, development and operation projects for a major publishing company trended favorably. In addition, server surveillance robots, and AR applications ("Shiroishi Castle Tour" in Miyagi Prefecture), "Factory Tour Navigation" (Adaptation of "Yubi Sashi Navi") orders were booked. At the same time, consigned development and research and development for declining birthrate countermeasures, information sharing, new energies, smart agriculture and other "regional economy revitalization" related projects were promoted. As an in-house service, the acceleration in the trend for companies to introduce smartphones and tablets was taken into consideration in the start of marketing of the smartphone kitting tool "Concerto" product created by the subsidiary Promote, Inc. Also, efforts to expand the breadth of services including "Biz Talk" messenger applications, reverse auction "Profair", and IP telephone application "AplosOne" for corporate users are being conducted. In addition to intensifying competition between various carrier contents, the business environment is becoming more difficult due to government regulation of communications services. Therefore, strong and sustained alliances with cellular telephone sales companies are required to survive competition in the realm of carrier contents. During the first half, the acquisition and sales of "Ongaku Kiki Hodai (All You Can Listen to Music)", "Traffic Information" and other superior contents with the potential to win long term users trended favorably. The business environment in the Chinese cellular telephone market trended favorably on the back of strong replacement demand for handsets from wealthy consumers. Efforts to fortify sales to corporate clients were successful, too, and sales volumes of cellular handsets during the first half trended at high levels (nearly double that of the previous first half). In addition, NE Yin Run Co., Ltd. was established as a joint venture company with New Insight Holdings Group Limited (Shanghai, China, Capitalized at 50 million Chinese yuan or approximately ¥0.95 billion) on October 2, 2015 as part of the business for the "Hello Kitty Park" in China. Nihon Enterprise has conducted various services leveraging its know-how and network established since the start of its operations in China in 2002 including 1) mobile contents distribution business, 2) cellular telephone sales operations, and 3) consulting to link Japanese and Chinese companies. At the same time, New Insight Holdings Group Limited, which conducts real estate development and infrastructure facilitation, signed a licensing agreement with Sanrio Co., Ltd. for the operation of a "Hello Kitty Park" theme park (Officially opened in July 2015) in Zhejiang Province, China. Nihon Enterprise has provided consulting to New Insight Holdings Group Limited in the course of forming this contact for the "Hello Kitty Park". "Hello Kitty Park" is the first theme park facility representing Sanrio characters including Hello Kitty in China, and is part of an international resort joint venture project by the two cities of Shanghai and Hangzhou. The total surface area of the facility is as large as about 100,000 square meters, and is expected to host one million guests per year. NE Yin Run Co., Ltd. will export Sanrio character goods from Japan to be sold at the "Hello Kitty Park". NE Yin Run Co., Ltd. was established for stable provision of related character products, which is expected to help strengthen the Park's overall operations. Company: NE Yin Run Co., Ltd. The factors behind this revision include a decline in advertising efficiency for the monthly subscription fee service and delays in new carrier fixed rate fee service contents of the contents services business, and scaling down of some large development projects and worsening of the advertising (Advertising agent service) business environment in the solutions business. Nihon Enterprise will aggressively promote expansion of its existing businesses and capture of consigned development projects on the back of continued favorable trends in information systems investments by corporations to ensure that it achieves its revised estimates. In addition, the expansion in business realms on the back of regional economy revitalization efforts and new business development will be aggressively pursued. Efforts are being made to fortify the earnings generating capability of contents for carrier's official websites and fixed rate fee services are being implemented. At the same time, measures to promote global deployment of "contents platform" including communications services (Native applications) based upon women's life support services and a messenger application within the contents services business are also being conducted. 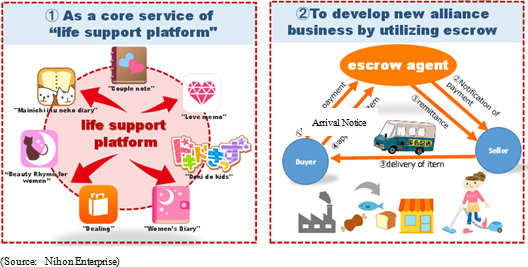 At the same time, Nihon Enterprise will endeavor to expand the consigned development for smart device related applications, operational support services, advertising (Advertising agent), alliances and regional economy revitalization services within the solutions business. The Company will also endeavor to grow robots, artificial intelligence, Internet of things, HEMS, wearable and other growth business realms in light of the arrival of the age of smart devices. The share of smartphones of the overall cellular telephones has risen to 54.1% at the end of 2015 (According to data of a research company), but the speed of diffusion is slowing. Therefore, the earnings environment for the mobile contents business is also changing with a slight decline in profitability. Nihon Enterprise has been able to predict this change in business environment and is conducting efforts to develop various contents and services. In light of these pronounced changes, they have frontloaded the strengthening of traffic information (While sales have fallen shy of expectations, aggressive advertising spending during this second quarter has necessitated a downward revision to sales and profit estimates for the full year) during the first half. But because of the diffusion of smartphones, the smartphone contents market has grown to ¥1.3026 trillion in 2014. Therefore, Nihon Enterprise seeks to acquire members by effectively leveraging its cellular telephone sales company partners that have become storefront affiliates for "monthly subscription fee contents" service. At the same time, collaboration with carriers will be strengthened to expand "fixed rate fee" services. Also, alliances with companies in other industries will be formed to increase users as part of the Company's strategy of growing earnings of the existing services within the realm of "native applications". In addition, the arrival of the smart device age as reflected by the trends of robots, artificial intelligence, Internet of Things, HEMS, and wearable products is a large business opportunity for Nihon Enterprise to leverage its bountiful experience in mobile related systems and applications development capabilities and its superior clientele. Nihon Enterprise expects to expand its business domain into these and other growth realms, and its current efforts to plant the "seeds for future growth" are a reason for the revision of earnings in the current fiscal year. Copyright(C) 2016, All Rights Reserved by Investment Bridge Co., Ltd.